My students love me so much that they gave me a box of paper made from elephant ca-ca! Seriously, I love it…this morning my private students gave me a box of handmade note paper that is really made from, well, elephant poo poo. Go to The Great Elephant Poo Poo Paper Company. My students know I’m all about the environment and that I love elephants so they thought it was the perfect gift. The paper is 100% recycled and odorless (good thing!) A percentage of the profits from the sale of the poo poo paper (I love that phrase!) is contributed towards the conservation of elephants. So check out the website. They have neat journals for people on your Christmas gift list who love to journal and also stationary sets for people who still write letters. I love handmade paper. It has character. One of the things I’m taking to India is a handmade journal I bought at an art fair. Everything is handmade, even the leather cover. The artist told me that he buys hides from a beef processing plant (yuck), tools them into journal covers, and also makes the paper. My journal has a deep, rich burgundy cover that will become seasoned and burnished the more I handle it, like the way an old saddle gets or an old pair of boots. The paper inside is rough and scratchy with a nice earthy feel to it. I looked at many journals at the artist’s table, but when I picked up this particular one, a picture flew into my mind — I saw myself sitting outside a temple in India, journaling. I was meant to have this special journal. When I paid for it, I said to the artist, “I know this sounds weird, but…”, and I told him what I “saw.” He looked at me, smiled, and said, “it’s not weird in my world…” mine neither, bro. 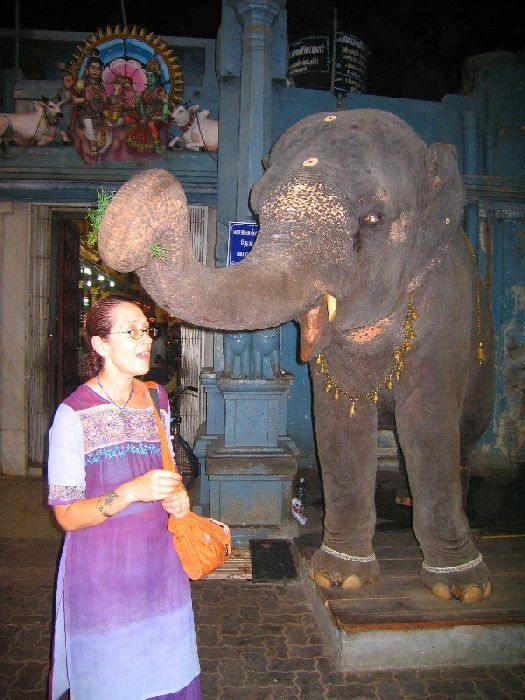 and yes, that IS a picture of me being blessed by the temple elephant in Pondicherry, India, 2005. now THAT was the money shot!